During the 2008 Desert RATS tests at Black Point Lava Flow in Arizona, engineers, geologists and astronauts came together to test the surface version of the Space Exploration Vehicle. Futuristic technology that could help astronauts explore an asteroid in deep space is getting a workout in the Arizona desert during NASA field trials. The gear includes a high-tech space truck for drives on a planetary surface, a robotic rover assistant, astronaut habitats and deep-space communication systems, among other things. It's all being tested at Arizona's Black Point Lava Flow from Aug. 27 through Sept. 12 as part of NASA's Research and Technology Studies — also known as Desert RATS — demonstration program. NASA's Desert RATS analog testing helps scientists and engineers see how their systems might perform on the surface of another world. The program, which has been held every year since 1998, aids NASA planning for possible missions to the moon, Mars and asteroids. This year, potential visits to space rocks take center stage. 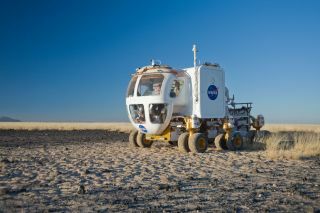 One of the technologies being put through its paces in Arizona this year is the Space Exploration Vehicle. The SEV can be configured to fly freely through space, or it can sit atop a 12-wheeled chassis to become a burly, capable rover about the size of a pickup truck. Either way, the SEV's pressurized cabin can carry two astronauts on 14-day trips, NASA officials said. Hatchlike "suitports" on the vehicle's exterior make getting outside — and coming back in — a quick and easy process. Also being tested is NASA's Centaur rover, a gleaming gold vehicle that can carry the agency's dexterous humanoid robot helper, Robonaut. Robonaut is just a torso, so Centaur would give the robot some vital mobility. Other tools, such as digging implements, could also be affixed to the Centaur, officials said. NASA's Robonaut 2 strikes a post atop its new wheeled base, Centaur 2, at the Johnson Space Center Planetary Analog Test Site in Houston. The Centaur base builds off of lessons learned through the Space Exploration Vehicle, a rover for astronauts, and could allow the dexterous humanoid robot to help with the future exploration of distant planetary surfaces. Desert RATS is trying out potential habitat units, which could house astronauts on the surface of another world. The 2011 version of these habitats will be different than past ones, boasting an inflatable second-story loft, researchers said. Scientists will also look into the best ways to communicate with astronauts exploring an asteroid or other deep space destination. The time lag between those astronauts and mission controllers on Earth could be a minute or two, potentially complicating communications. "We're trying to understand the best way to go about that," Noble said. Researchers, she added, will "try and test out things like using text messaging instead of voice communication." This year's focus on asteroids is consistent with NASA's space exploration goals going forward. Last year, President Obama directed the space agency to concentrate on getting astronauts to an asteroid by 2025, then on to Mars by the mid-2030s. NASA also has an asteroid sample-return mission in the works. This effort, known as Osiris-Rex, should bring pieces of the asteroid 1999 RQ36 back to Earth in 2023.